Description of "grass with roots: experiences from participatory development (eBook)"
Kasare village is like any other village. Rainfall is low. Terrain is undulating and difficult. Water was always a problem. There were no crops. People migrated to Mumbai and Pune for work. From such a situation, the villagers changed their village and also their lives. Water conservation through watershed development totally changed the scenario. Imaginative and high income generating cropping is the norm. Water is plenty. There are not even traces of poverty in any household; nor do farmers ever think of suicides here. Gottigaripalli village is a remarkable story of collective triumph against nature’s adversity like low rainfall and difficult terrain. Kasare and Gottigaripalli villages are like our own miniature Israel. Transformed from once considered wastelands to present evergreen fields, agriculture is showering wealth on people here. Whereas Kasare and Gottigaripalli changed their destiny with intelligent watershed development and resultant water conservation, adjoining villages remain where they were; even now, drinking water has to be brought by tankers from outside. Experience shows that the landless generally get land allotment far away from their habitations. The lands are also mostly fallow or at times difficult parcels where a lot of effort and investment is needed to make these cultivable. A different experience is shared here where the landless belonging to a backward tribe selected and purchased agriculture land for all the families near their habitation. The results are a learning experience for lifetime; not only their living conditions improved but also their self-esteem has gone up. The experience is relevant as nearly one third of rural households are landless and half of the households depend upon manual labour for livelihood in India. The experience of landless people belonging to a nomadic tribe living close to Solapur town in Maharashtra is a classic example where despite so many development programmes including those specific to tribal development, they find their living tough. For fishermen and women of Orissa’s sea village, Gopalpur, life is a daily battle against sea storms on one hand and exploiting middlemen on the other. Help from various Government programmes is making slow impact; but the needs are many and diverse. Nearly 60% of agriculture in India is mono crop. Single crop and rural poverty go together. Rural poverty in turn adversely impacts education, health and nutrition of a huge part of our country. There are also vast areas which do not have any agriculture activity. All these present opportunity for alternative thinking to go for imaginative crops which change people’s lives. Today, self-help groups (SHGs) are there everywhere. But, they are like enormous energy waiting to be tapped and also awakened. The experience of SHGs of Midnapore shows that they can be agents of social transformation in our villages. The scope for bringing desired change is limited only by our imagination. All the experiences shared in this collection have a common underlying theme; there is so much to do and at the same time so much can be done with imaginative ideas and interventions. Development planning and execution must resonate with common people’s heartbeats. The author has been fortunate to be associated with these interventions; and also with their dreams, sorrows and struggles. Dr. M V Rao, an Indian Administrative Service officer, served as Director General, National Institute of Rural Development and Panchayati Raj (NIRD & PR) and Chief Executive, National Fisheries Development Board (NFDB). He also held assignments of District Magistrate of Malda, undivided Midnapore and West Midnapore districts of West Bengal. He was also Senior Consultant to UNICEF. He has been working for several years on innovative, practical and action-oriented ideas for participatory development of people at grass roots. His earlier publications include Rooted to The Ground: An Indian Civil Servant’s Field Notes (2015), Persistence and Change in Tribal India (2012) and Development for the People: Innovations in Administration (2002). 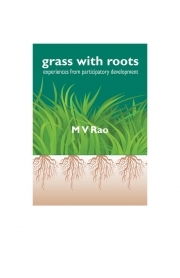 Reviews of "grass with roots: experiences from participatory development (eBook)"
The book is seemed to be a handy material for the development activists, field functionaries and students. Showcasing the case studies with a proper relevancy made this book more interesting. It is really Worth reading!! Having gone through the book 'grass with roots' I am pleased with the several initiatives mentioned for people's development. The writer.Dr. M V Rao deserves compliments for narrating experiences of positive change achieved in lives of the poor. A Great Book to read for Every one .An inspirational book especially for people who are working in field for Socioeconomic development & welfare of the Society.A must read book for all types of people for Success in any field. This book defining "IMPOSSIBLE" as I M POSSIBLE.....A true story narrating the transformation from nothing to everything with the help of little bit of technology and ofcourse consistent effort. I would like to thank the writer Dr. M.V.Rao Sir for sharing his wonderful journey transforming life of millions of people. It is inspiring and motivating for the leaders and youths of our nation ..."Kuch bhi sambhaw hai" [Anything is possible] with the help of effective leadership, consistent effort, technology support and most important hope..This journey giving us a believe and hope that we can transform various villages like Kasare and Gottigaripalli......in to villages full of life, happiness and hope.. This book is also one of his best book. The author Dr.M.V Rao always presents the real scenario which gives feel of our own society. Here also he wrote in very simple words but innvotive & idealistic which drives us to the subject. As he rightly mentioned Development planning and execution must resonate with common people’s heartbeats. This book makes us part of his interventions; and also people/ societie's dreams, sorrows and struggles. Like his other books this is also eye opner & based on ground reality of the field. Really this book is grass which is rooted to ground & very nicely showered by Author Dr.M.V.Rao.